Got a bad body part? Stop by the body shop for a replacement. The baby boomers are going "bionic," according to a recent ChangeWave survey of 148 doctors involved in the medical devices market. The survey looked at demand trends for joint replacements, cardiac implants and other types of body repair and correction medical products. When a limb or organ no longer functions properly, one increasingly popular option is to replace it with a "bionic" device -- i.e., a mechanism that uses electronic or mechanical components to enhance or replace damaged body parts. One-in-two (50%) doctor respondents to the survey believe Joint Repair/ Replacement devices will experience the largest growth in demand over the next 12 months -- well ahead of Artificial/ Implantable Cardiac devices (24%) and Spine & Back Repair/Replacement devices (20%). According to the survey, joint replacement manufacturers Stryker (SYK) (27%) and Zimmer (ZMH) (20%) are the companies most likely to benefit most from this growth in demand for bionics, along with cardiac device maker Medtronic (MDT) (27%). "I'm old enough to remember the 1970s TV show The Six Million Dollar Man," said Tobin Smith, founder of ChangeWave and editor of ChangeWave Investing. "And while we aren't quite there yet in terms of bionic technology, the fact that many aging baby boomers are looking for knee and hip replacements translates into big gains not only for the technology in general, but also for the companies specializing in this sector." 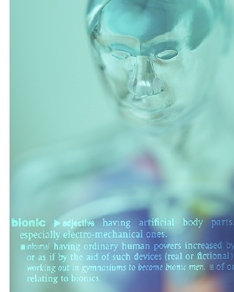 (Detailed charts on Bionic Medical Devices, along with additional ChangeWave findings can be downloaded at changewave.com/bionic). Which types of devices are most likely to experience new technology breakthroughs over the next 12-24 months? Joint Repair/Replacement Devices (31%), along with Prosthetic Limbs (30%) head up the list of devices that are most likely to experience technology breakthroughs going forward, according to the survey results. Dental Implants (25%), Vision Correction Devices (23%) and Back/ Spine Repair & Replacement solutions (21%) also received significant mention. In a highly positive finding for the growth of bionic devices, 31% of doctors think insurance companies and other payors will be More Willing to reimburse healthcare providers for these devices over the next 12 months. Only 18% think they will be Less Willing. To sign-up for real-time email alerts from ChangeWave on emerging technology and medical trends and companies, visit changewave.com/hotwire. ChangeWave runs a proprietary network of more than 15,000 highly qualified business, technology, and medical professionals in leading companies of select industries - credentialed experts who spend their everyday lives working on the frontline of technological change. ChangeWave surveys its members on a range of business and investment research topics, collects feedback from them electronically, and converts the information into quantitative and qualitative reports. For more information, visit blog.changewave.com.